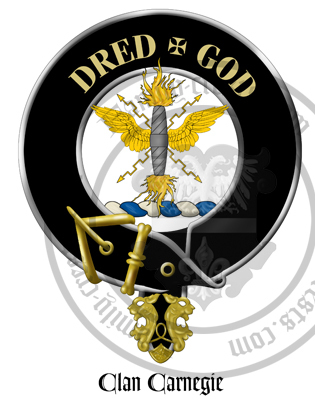 Clan Badge: A thunderbolt proper, winged or. The Carnegies took their name from the area around Carmyllie, Angus. The family who adopted this name however, were originally known under an earlier adopted placename of Balinhard which is also in Angus. The Balinhards can be found in records from 1230. In 1358 John of Balinhard was granted the lands and barony of Carnegie by Walter de Maule. He became John the 1st of Carnegie and lived until 1370. John Carnegie of that Ilk was his successor and a direct family line ran from him until 1530. It was in 1409 that Duthac of Carnegie acquired part of the lands of Kinnaird and an important Carnegie line developed in this area. 16th Century & Anglo Scottish Wars: In the 16th century during the Anglo Scottish Wars with England the Clan Chief John Carnegie of Kinnaird led the clan against the English at the Battle of Flodden Field in 1513 where he was slain. The son of John Carnegie was called Robert who fought against the English at the Battle of Pinkie Cleugh in 1547 where he was captured and taken prisoner. When Robert was released he was knighted and made Scotland's ambassador to France in 1556. Robert was also the first of the Carnegies to claim that his ancestors were the cup bearers to the Kings of Scotland. This royal office is remembered in the family arms which bear an ancient cup. 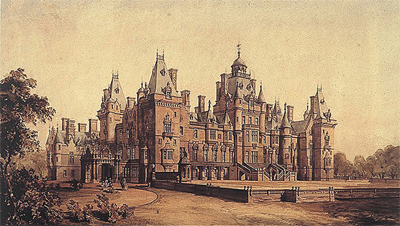 17th Century & Civil War: In 1616 Sir David Carnegie, 8th of Kinnaird, was made Lord Carnegie of Kinnaird. In 1633 he was created Earl of Southesk. The second Earl James was imprisoned by Oliver Cromwell for his Royalist beliefs. He was known as the ‘Black Earl’ because he reputedly learned magic at Padau. James Carnegie, second Earl of Southesk, succeeded his father in 1658, although he was nearly killed in a duel with the Master of Gray in London in 1660. The younger son of the third Earl was not so fortunate in his duelling career and was killed in Paris in 1681 by William, son of the Duchess of Lauderdale. 18th Century & Jacobite Uprisings: Descending from a younger son of the 1st Earl of Southesk was Sir James Carnegie of Pittarrow, the distinguished soldier. In 1663 this line was created Baronets of Nova Scotia. During the Jacobite Uprisings of 1715, Lord Southesk and Glengarry worked closely in the Jacobite Army. Arms: Argent, an eagle displayed azure, armed, beaked and membered Gules, on its breast an antique covered cup or. Crest: A thunderbolt proper, winged or. Supporters: (Earl of Southesk only) Two talbots argent, collared gules. The family seat today is at Kinnaird Castle, Brechin in Angus. 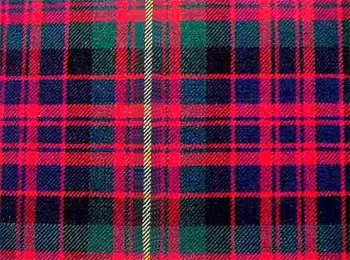 Tartan: The Carnegie tartan, is based on the Glengarry tartan.